Article updated September 12, 2013 with additional information about Jack Olsen. "Savor fresh seafood treasures and frozen Strawberry Margaritas in this nautical oyster bar surrounded by Buena Vista Lagoon. Open at 11 am." Things come and go at Walt Disney World - always have, always will. And as we speak Walt Disney World is moving forward with its rebuilding of their "Downtown Disney" area into something called Disney Springs, a significant thing has happened, and it is the sort of thing which runs the risk of passing us by quietly. In Disney circles, the unloved are forgotten quickly. While future generations have mountains of material to remember Horizons by, just try to find material on the Fantasyland show where guests danced the "macarena". Although the intent has never been to present Passport to Dreams as a sort of obituary column for early Walt Disney World, just as the removal of Snow White's Scary Adventure last year prompted a passing notice, here we must pause to give due consideration to an early feature of Another Magic Corner of the World, and the significance of its removal is very much likely to be overlooked. Cap'n Jack's Restaurant, not much loved in the world, has closed. But it wasn't always that way. The Lake Buena Vista Shopping Village is but a fading memory by now, having been thoroughly disassembled by waves of refurbishments in the 1990s and 2000s - curtailed, re-arranged, cut up, truncated, and scattered. 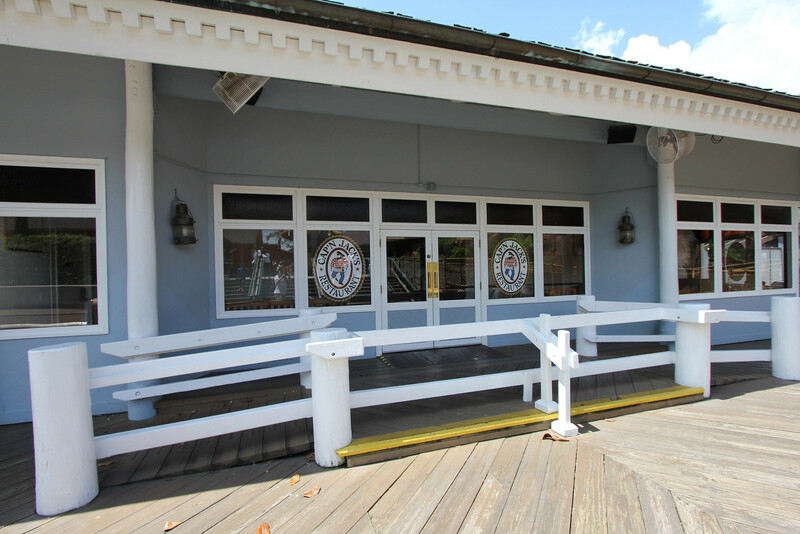 Through it all, the unassuming Cap'n Jack's Oyster Bar has remained remarkably intact, even while formidable and lauded giants of the Village fell all around it: the Village Restaurant, Gourmet Pantry, Christmas Chalet, and Character Shop are all now gone. 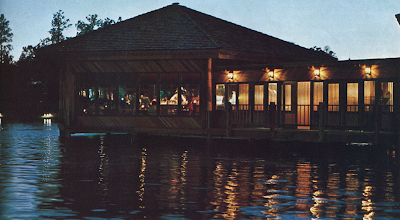 Even the once formidable Chef Mickey's failed to make waves on this little dockside dinette when it departed for the Contemporary in 1996, opening up its former space for rubber elephants and silk plants. Cap'n Jack's endured as decade after decade passed, and it nearly made it across the forty-year mark as the last remaining Disney-owned restaurant in the Village. That is, naturally, what doomed it. Disney, in their new "Disney Springs" model, wishes to act more as a benevolent landlord and less as a participant, and Cap'n Jack's is being razed to make way for a new walkway spanning the Village Lagoon. That, as they say, is progress. Yet who could've imagined, in 1975, that Cap'n Jack's of all things would one day be the last vestige of a bygone era? Anyone betting on such a proposition surely would've chosen The Village Lounge, Gourmet Pantry, Village Spirits, almost anything that opened in those heady early years. It was an era when Disney wanted to do things themselves - and they often did. A movie studio has no business building submarines, operating hotels, or selling antiques, but Disney did all of that - in house, and with the flair of their showbusiness roots. 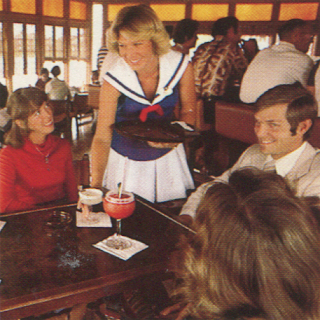 And so they decided to operate an oyster bar, and they were so good at it that they opened another - Cococino Cove, at the Contemporary, followed in 1977. But we are getting ahead of our story. 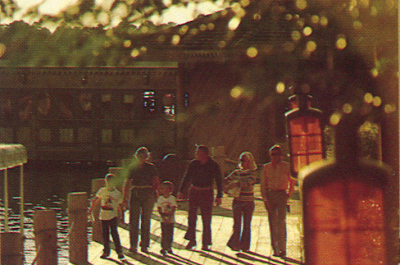 In 1975, the Shopping Village was intended to be Disney's stepstone into a larger world not confined inside a railroad. Lake Buena Vista was intended to grow into a community of townhouses, condominums, and timeshare communities complete with a downtown that would appeal to locals and tourists alike and a mass transit hub linking Walt Disney World into planned train routes from Tampa up to Daytona Beach. The Village was intended to draw as much local as tourism money. To this end Disney built the highest of high end shopping plazas smack in the middle of a city which ten years ago could hardly qualify as a cow town. Early shops such as Carolyn's Couture and Miss Merrily's Madness were serious, top line clothing boutiques selling custom clothes of the kind then only seen in New York and Los Angeles. Gourmet Pantry was selling dry-aged beef decades before anyone in Orlando had ever heard of Wagyu. Village Spirits offered wines and wine tastings which constituted an entire in-house education for those ready for it. In a very real way, Disney brought the Orlando food culture forward twenty years in five, and the keystone of that effort was the smart, stylish, and adult Lake Buena Vista Shopping Village. Whatever high-end food can now be found in and around Orlando has a distant antecedent at Disney. Cap'n Jack's was one of two Village establishments open until the wee hours, and both it and the Village Chummery were within spitting distance of each other (and the parking lot and boat dock) to make containing late-night crowds more manageable. 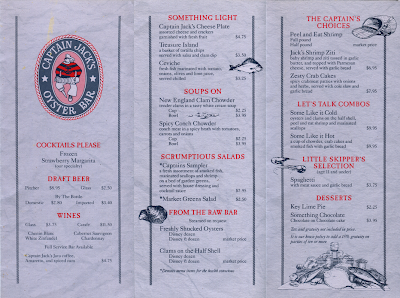 Cap'n Jack's was in size and layout essentially a tavern and the stylish Chummery, adjoining the Village Restaurant, a lounge masquerading as a living room full of overstuffed chairs. 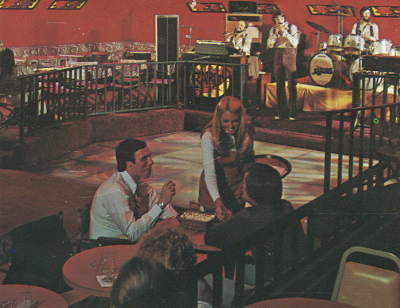 To ensure drawing power to the new Shopping Village, Disney relocated their popular Saltwater Express group from the Polynesian to the Chummery, and these two establishments, along with the Giraffe Discotheque across the street in the nearby Royal Plaza Hotel, represented practically all of Orlando's nascent nightlight scene. "Stop by Windjammer Mercantile for every concievable style, color, and size bathing suit. [Carolyn Harris, women's wear buyer] said that the swimsuit industry will each week have a different manufactuer at the Windjammer modeling its products. 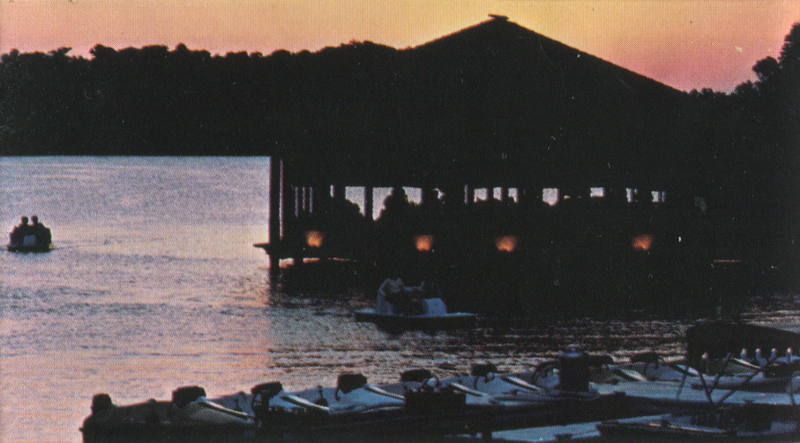 The models, gentlemen, will parade along the dock that leads to Captain Jack's Oyster Bar. [..] Captain Jack's, with its steamed clams and oysters-on-the-halfshell offerings should prove to be a big hit since its being built right out on the water." What finally opened in 1975 was a three-part structure extending out into the newly created Village Lagoon. The front two sections - a wide glass-walled showroom and a narrower hallway behind it lined with a nautical porch (for modeling!) 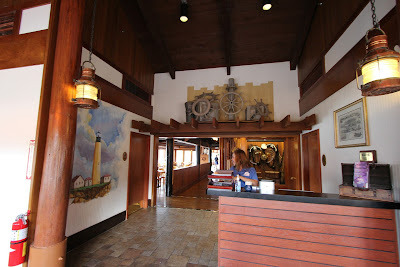 on either side - was what opened as the Windjammer Dock Shop, with a sort of informal spill-over area for lounging between the shop and Oyster Bar. 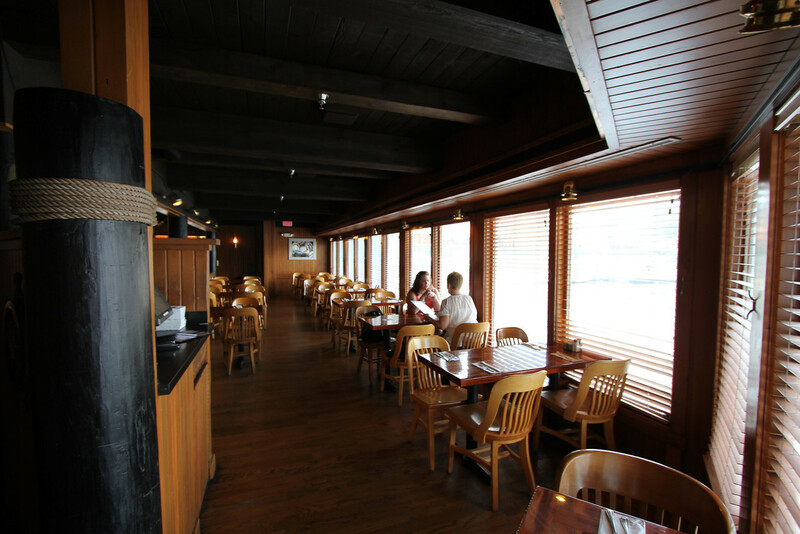 The hexagonal Cap'n Jack's sat out on the end, with a six-sided bar and seats along the windows. Patrons to the south side enjoyed a view of the Village Marina, heavy on aged woods and amber craftwork lanterns, and those to the north had a view of the Lake Buena Vista townhouses and the comings and goings of electric Flote Boats headed to and from the Lake Buena Vista Club at the Cruise Dock. In those early years, Cap'n Jack's directly faced nothing but a sea of natural Florida cypress and scrub across the water of the lagoon. Appropriately for its location, the name of the establishment paid tribute to Jack Olsen, who ran Disneyland's Merchandise department from 1964 to 1970. An avid sailor, Olsen is the one who established the pattern which Disney theme park merchandise maintained until the 1990s - unique products, store as show, and limited Mickey merchandise. It is likely Olsen who contributed to such unique shopping locations as Olde World Antiques in Liberty Square and it is his demands on his department which made the Shopping Village as unique as it was. Olsen retired from Walt Disney World in 1977. An exciting new house drink has been introduced at Cap'n Jack's Oyster Bar and the Village Chummery. It's called a strawberry margarita and it's made from the only Valido Fresa (Strawberry Tequila) this side of the Rockies. Original tequila is the distillate from the sap of a Century Plant - a sort of cactus resembling a "pregnant" pineapple. It's found all over the Mexican desert surrounding the town of Tequila. Strawberry Tequila, however, is found only in two locations - California, and the Village Spirits. Enjoy a unique Strawberry Margarita at Cap'n Jack's Oyster Bar, then try your hand at preparing one yourself. Just secure a bottle of Valido Fresa from the Village Spirits and follow this recipe: mix the Strawberry Tequila, Triple Sec, regular tequila, and sweetened lemon and lime in a frosted 12 ounce wine glass. Coat the rim lightly with salt and garnish with lemon wedges. Ole! In no time at all, you'll have become the most popular bartender around!" 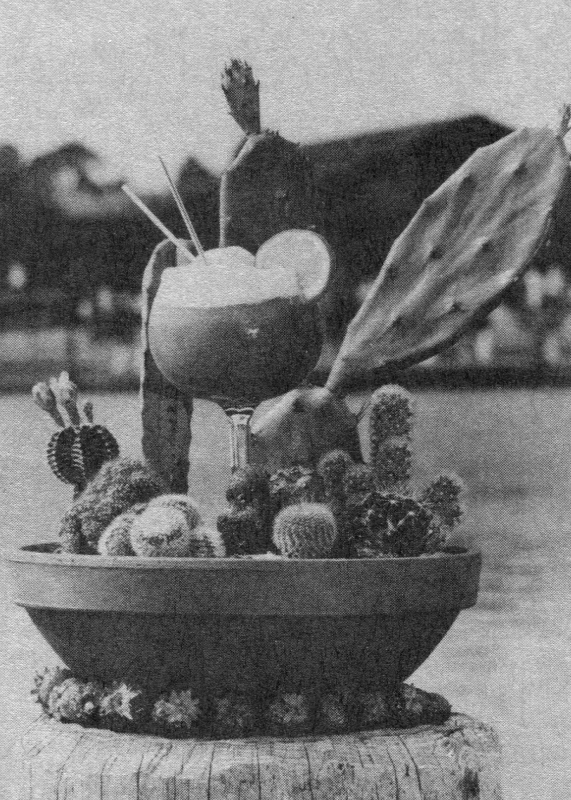 The unbeatable combo of Saltwater Express and strawberry margaritas, however, may have been too potent: within a few weeks, the popular folk combo was back at the Polynesian Village. After several months of Disney-provided entertainment, The Chummery was rechristened the Village Lounge and began its long-running series of rotating jazz performances by December 1975. These jazz sets by famous artists became a major draw, to the extent that music and jazz enthusiasts from college campuses as far flung as University of Florida began filling up the Lounge on weekends, leading Disney to institute a cover charge. "The menu at this water-side spot is so full of good things - seafood marinara, stuffed clams, ceviche (marinated raw fish), crab claws, clams and oysters and the half shell, and delicious smoked kingfish with guacamole - that it's as terrific for a light lunch or dinner as it is for a snack, even though the place is nominally a bar. Cap'n Jack's is a terrific place to be, especially in the later afternoon, as the sun streams through the narrow-slated blinds and glints on the polished tables and the copper above the bar. And the house's special frozen strawberry margaritas - made with fresh fruit, strawberry tequila, and a couple other potent ingredients - are as tasty as they are beautiful. They're served in big balloon-shaped goblets, with a slice of lime astraddle the rim: tart, slightly fruity, and altogether delightful." The first shock to the system which should've killed off Cap'n Jack's (but didn't) was the removal of the Village Restaurant in 1989. Without a lifeline of jazz enthusiasts to keep this part of the World humming, the late nights at Jack's fell by the wayside. The energy had shifted east to the new Pleasure Island nightspot, and since management had decreed that Pleasure Island was the new "adult" hotspot, the Village changed its image to better accomodate children and families. Heidelberger's Deli became The All American Sandwich Shop, The Verandah Restaurant became Minnie Mia's Pizzeria (can't make this stuff up...), and the Village Lounge was now the waiting area for Chef Mickey's, showing cartoons where jazz trombonists once filled houses. At this time, Cap'n Jack's was expanded and the transition space between the Dock Shop and the Oyster Bar became more seating space. A proper kitchen was added at this time as well, allowing Jack to serve full meals instead of just mixed drinks and some simple seafood dishes. This was accomplished by expanding out onto what was once the dock-themed porches to the north and south, enclosing this space with glass windows, unfortunately giving the building a lumpy appearance not present in the original, sleek and symmetrical design. The former modeling promenade was divided between seating and the new kitchen. Still, Cap'n Jack rolled on for another seven years, until the second shock that should've killed it off came around. In 1995 and 1996 as part of the same project which eventually gave us the West Side, Disney leveled the original Pottery/Christmas Chalet complex to the east side of the Village Lagoon and built World of Disney on that spot. 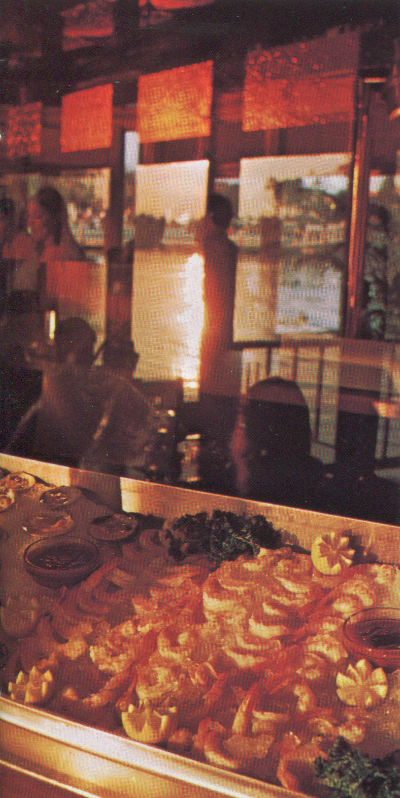 At the same time they leased out both the Village Restaurant and Empress Lilly to outside tenants, moving Chef Mickey's to the Contemporary Resort and turning it into a buffet. Now Cap'n Jack's nearest neighbor was a smoking volcano, and the beautiful Empress Lilly restaurant was painted stark grey and became the rambling Fulton's Crab House. At this time Cap'n Jack's was given a blue/white paint scheme to further an ostensible "New England" theme. 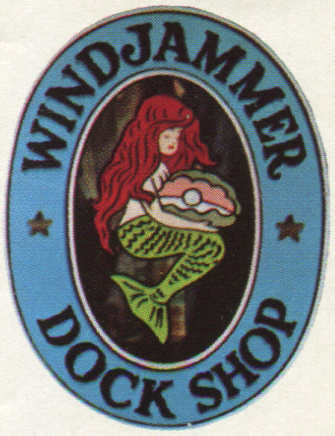 By early 1996, the Windjammer Dock Shop was gone for good and its former location had become the waiting area for Jack's. Once World of Disney was open all of the Village's original wood and earth tones had been painted over with bright colors, the Captain's Tower reflection pond was filled in with a train ride for toddlers, and Lego characters popped out of the Lagoon where once willows gently waved above the water. 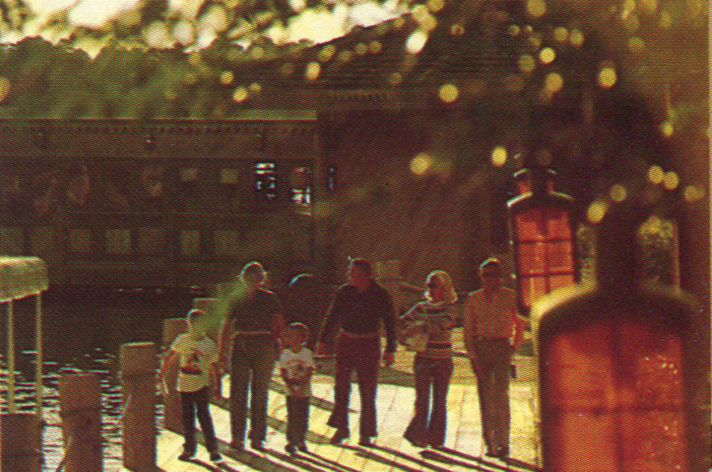 Lake Buena Vista was a memory, and Cap'n Jack's was an anachronism. But it continued along for nearly another twenty years without anybody paying much attention to it. 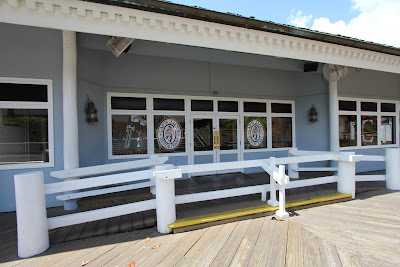 The constant expansion from what was once just a bar into a full family restaurant certainly implies some degree of success, but Cap'n Jack's remained for years one of the easiest eateries at Walt Disney World to get seated at. At some point in the last fifteen years it was renamed Cap'n Jack's Restaurant, and Jack himself was redrawn to look a bit trimmer and friendlier, but the years moved very slowly by. The Village Marketplace was a busy place, and Cap'n Jack's was not. Reception area, looking into the former modeling promenade space. Still, it endured. It endured the rocky mid-2000s, when everyone seemed sure it was due to receive a Pirates of the Caribbean overlay to cash in on a coincidentally named certain other Jack. It did not. Since Disney seems ever willing to invest in quick cash-grab tie ins, the fact that this did not happen is perhaps a red flag instead of something to be celebrated. 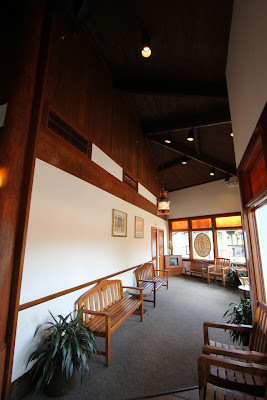 The enclosed porch / expanded seating area. I had exactly one experience inside Cap'n Jack's - in 2005. My mother and I were fatigued from an entire day of Downtown Disney, and we wandered into Jack's in desperate need of nothing but a seat and something to eat, and Jack's was the only option available. It was one of those particuarly nasty overcast kind of Florida days, where the heat just seems to stick to your entire body. The meal was entirely unmemorable. I remember it started to rain while we were inside, and that we were seated along the back wall, and even with most of the restaurant empty the place seemed far too poorly laid out. Not being a seafood person, I probably ordered a steak, although I can hardly remember anything about it except finding the entire experience unpleasant. It wasn't until a few years later that I began to research the Walt Disney World Village / Marketplace and found out that Jack's had any history at all. The original Cap'n Jack's Oyster Bar, almost entirely untouched. Through most of the 2000s, Jack was in the doldrums. The restaurant's reputation was extremely poor, and the few people who wandered in hardly seem to have been able to describe anything memorable about it at all. The announcement that it was set to be demolished to make way for a new walkway, official as of only a few months ago, then hardly ranks as a surprise. But in another way it's a shame, and not just because the food is reported to have improved in the last few years, per evidence presented in this 2013 review and photos on Disney Food Blog. It's because there's nothing especially broken about the location, idea or size of Cap'n Jack's - Disney just tried to make it into something it was not, which was a sort of in-house Red Lobster. 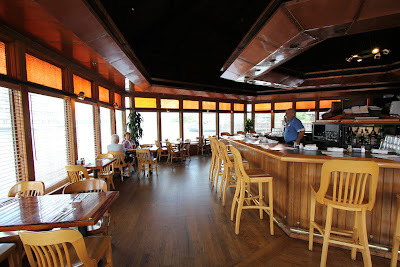 There still is a market for good, fresh seafood in an intimate setting, but Jack's was situated out on a pier trying to sell meals to families with kids who would rather eat at Rainforest Cafe. 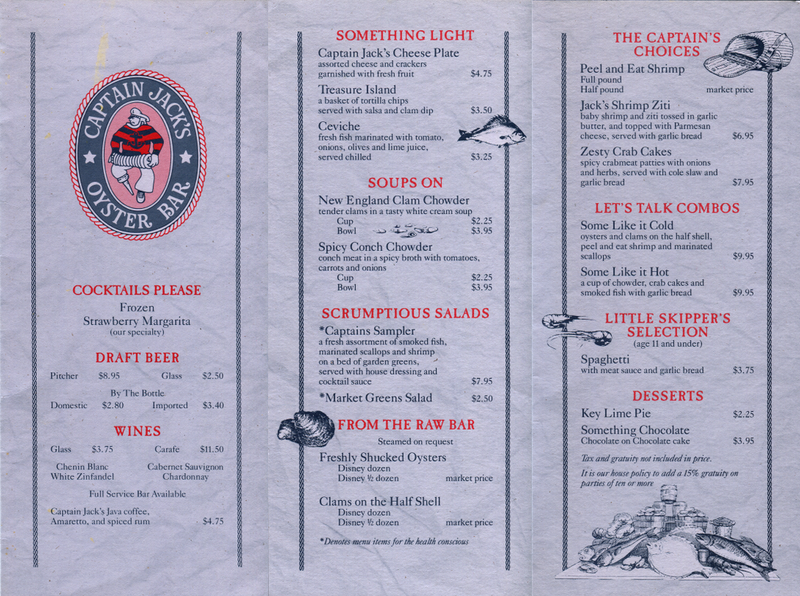 Cap'n Jack's could have gone in the opposite direction in the 2000s, away from the mass market it was jammed into in the late 80s, and towards one of exclusivity and uniqueness. In short, what it was doing back in the 70s to begin with. In another sense, it's always sad to lose something of the past which somehow remained unblemished by modern trends for so very long. Practically everything about the place, from its profoundly unfashionable woods and brass lanterns - even Red Lobster has given those up - to the stained glass panels, unique name and art, and even those dusty silk plants in the corners speaks to the very last little pocket of Lake Buena Vista which survives in the loud and ugly Downtown Disney. Even if the space had to be emptied out and converted to some kind of store, there surely is more to be gained by retaining the basic structure in some capacity than simply tearing down the last little bit of history the place has left. The preceding paragraph, of course, is little but spilled bandwidth. History has passed Cap'n Jack's by. But that's the reason why it's worth writing this article, here, and now, not so much to protest against Jack going quietly into the night, but to point out that, on the cusp of Disney Springs bursting onto the scene, that the last little bit of WED Enterprises's little Village where the water once lapped calmly along little European chalets is finally being dismantled. 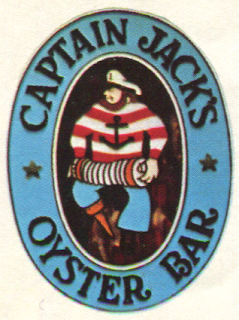 To revel in the weirdness that it lasted this long at all, and to show that even something as friendless as Cap'n Jack's Oyster Bar is a signifier of an era when things were done differently. It is, in short, a potent symbolic moment. Downtown Disney can't go home again.